BIBLE -Leaf on vellum from a manuscript Bible. BIBLE - Leaf on vellum from a manuscript Bible. 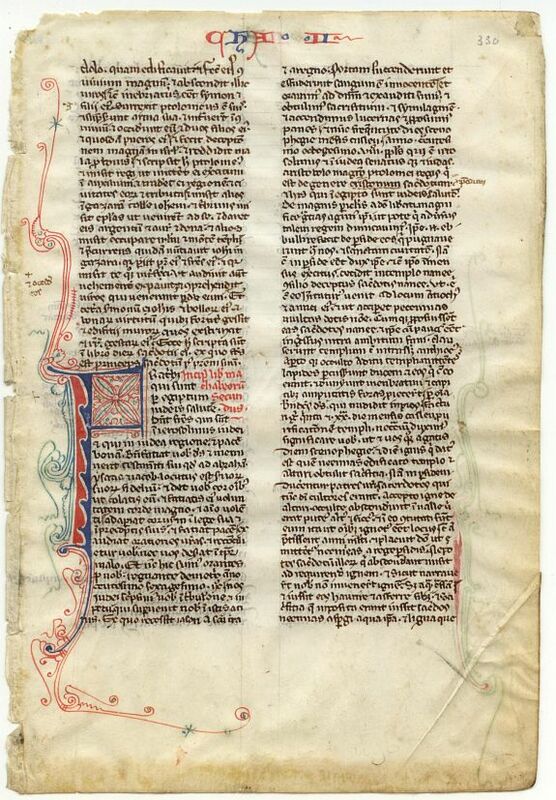 Title : Leaf on vellum from a manuscript Bible.. Size : 6.7 x 4.7 inches. / 17.0 x 12.0 cm. Description :Manuscript Bible leaf on vellum, more than 700 years old!! Probably from France. The Bible has, of course, always been the center of Christianity from the beginning, but as a book it was always in parts : to be read at certain times. The priests and monks studied the Psalms, or the Gospels, or the Minor Prophets, for instance. In Paris the birth of the Bible as one book took place, around 1200. There the Bible was put in a single volume, the order and names of the biblical books were standardized, and the text was checked for accuracy. For the first time the text was divided up into numbered chapters. The name that is attached to this is Stephen Langton, he of the Magna Charta! The text is in two columns, 50 lines, with 2 initials with pen work in red and blue. The name of the book is in red and blue letters at the top of the page. To give you an idea of the writing here is the transcription and translation of some lines of the recto, You will find that the scribes used many abbreviations ? the whole bible had to fit in one volume! In the margins are many words that the scribe forgot to write ? he must have had a bad day! Condition : A bit smudged around the borders.